Notes On The Spiritual Life: Do you know any saints? 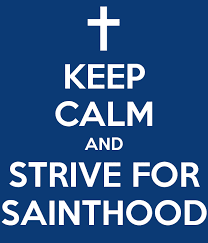 Some people say that the function of the church is to produce saints. The function of the church is to help people to become holy. Are there saints among us? Have there been in recent times? Dorothy Day has been proclaimed a "servant of God" which is a step toward canonization in the Roman Catholic church. Pope Francis has mentioned Dorothy Day along with Abraham Lincoln, Martin Luther King, Jr., and Thomas Merton as "exemplary Americans." Do you have your own names of holy people in your life? I think of Father Edward Lintz, the pastor of Nativity of Blessed Virgin Mary in Brockport, NY as a very holy man. He was a quiet saint, a servant of the people. There are people in the world committed to goodness. They aspire to goodness as the best way to live their lives and be in the world. If a person accepts the Atonement for oneself, (s)he cannot help but to be loving and Jesus tells us that the way to the Kingdom, the way to holiness, is to "love as I have loved." Has your church produced any saints? If yes, how? If no, why not?